The Cuban Vireo (Vireo gundlachii) is an endemic species of Cuba that is restricted to the large island of Cuba and its surrounding archipelago of small islands and cays (Neotropical Birds)(The Website of Everything). There are four sub-species of V. gundlachii. Two of these reside strictly on the island of Cuba while the other two sub-species live on some of the smaller surrounding islands (Neotropical Birds). 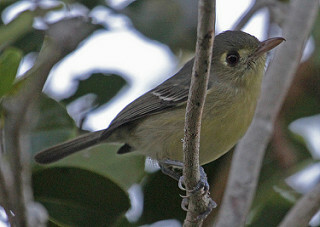 The Cuban Vireo is the most common vireo in Cuba. (iNaturalist). The main island of Cuba has a diverse range of landscapes. There are mountains and thick forests, vibrant cities and low shrub lands with tropical humidity and high seasonal temperatures. Species in the Vireo family commonly lives large woodlands and forests (The Website of Everything). However, V. gundlachii is often found living in coastal regions and lower elevation hills throughout Cuba (The Website of Everything). These habitats have mild temperatures and many trees. V. gundlachii tend to nest within these forests especially in areas with large, tall trees (Smithsonian). A common lowland, forested habitat where the Cuban Vireo is found is on the Isles of Pine, Cuba (Lembeye). Cuban Vireos also live in heavily degraded forests (The Website of Everything). Parts of Cuba’s forest have been destroyed due to logging. 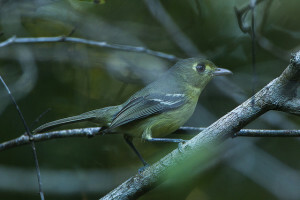 The Cuban Vireo, however, can find suitable nesting and feeding habitats in these degraded forests by utilizing smaller trees and even shrubs for nesting sites (iNaturalist.org). The species, then, due to this wide range of habitat tolerance can live in many sections of the island of Cuba (Bird Life International). The Cuban Vireo is a distinctive and recognizable bird due to its very specific coloration (described below). It is about thirteen centimeters long (Hand Book of the Birds of the World) and weighs between eleven point one to fifteen point two grams (Hand Book of the Birds of the World). The Cuban Vireo is a relatively small bird. It exhibits a yellowish-creamy color on its underside and is an olive green color on its top (Craves Julie A., and Kimberly R. Hall). Most Cuban Vireos have a full crown of feathers (Hand Book of the Birds of the World) and have very noticeable face features such as ear coverts and a dull back color. They also have creamy white patches on their faces from their lore’s to behind its small eyes (Hand Book of the Birds of the World). There are two different eye colors associated with Vireos. The White eyed Vireo and the Red eyed Vireo are the two types and usually stay separate from each other (Williamson, Ecological Monographs). Many times yellow throated Vireos mix between red and white eye Vireos (Williamson, Ecological Monographs). This means that different Vireo’s species will mate with each other from the island and archipelagos. The Cuban Vireos build well concealed, cup-like nests (Hand Book of the Birds of the World). The Vireos tend to build their nests out of natural materials such as plant fibers, mosses, grasses, and lichens (Hand Book of the Birds of the World). The nests are small and packed very tightly with the construction materials. Both Female Vireos and Male Vireos build nests at equal heights within the tree canopies (Penelope Williamson). They lay three eggs in a typical clutch (Neotropical Birds). The Vireos again build their nests in the taller trees of whatever habitat they happen to be living in and typically breed and nest during the months from March until August (Raffaele, Wildlife of the Caribbean). The Cuban Vireos only nest on Cuba and the surrounding small islands (Graber, Ecological Monographs). Although the Cuban Vireos breeding season is from March until August some studies have shown that they can also mate from April to June (Hand Book of the Birds of the World). Cuban Vireos seem to become more common during the winter months in Cuba (Craves, Hall, Journal of Caribbean Ornithology) although the precise reason for this is unclear. Cuban Vireos are very vocal and have a very high and loud song (Ornitología Neotropical). When the Vireos chip they can have a sound effect such as “swee-woo-swee” (Xeno-Canto). Their chirping is different from the songs they sing. When the Vireos sing their songs, it sounds like: “Chuee-Chuee” or “see-ree-ri-doo” (Hand Book of the Birds of the World). Vireos are very active in their vocal communication. The Cuban Vireo is a very common bird within the islands of Cuba and the surrounding archipelago (Ornitología Neotropical). The population of the Cuban Vireo has not been directly measured but is said to be on the decreasing by ten percent every ten years. (Bird Life International). This could possibly be due to the deforestation or illegal hunting. Although the species is said to be “common” its population is slowly decreasing over time. (Bird Life International). 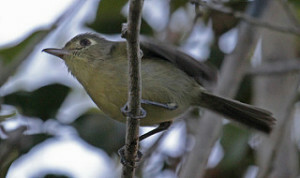 The Cuban Vireo has a large range of livable areas in Cuba (Bird Life International). The Cuban Vireo is even said to not be globally threatened primarily because it only is found in a very limited geographic region. (Hand Book of the Birds of the World). The population declines have caught the attention of Cuban authorities. Cuba has placed strict hunting policies to help protect the birds (Garrido, Cuban Endangered Birds). Cuban Vireo (Vireo Gundlachii). iNaturalist.org. 2013. Web. 30 September 2015. Cuban Vireo (Vireo Gundlachii). Xeno-canto. 2005. Web. 30 September 2015. Cuban Vireo Vireo Gundlachii Lembeye,1850. Avibase. 2003. Web. 30 September 2015. Cuban Vireo Vireo Gundlachii. Bird Life International. 2015. Web. 30 September 2015. Cuban Vireo. The Website of Everything. 2010. Web. 30 September 2015. Family Vireos (Vireonidae). Handbook of the birds of the world. 2010. Web. 30 September 2015. Garrido, O. H. and A. Kirkconnell. Field Guide to the Birds of Cuba. Ithaca. Cornell University Press. 2000. Print. Kirwan, Guy M. A birdwatchers’ guide to Cuba, Jamaica, Hispaniola, Puerto Rico and the Caymans. Prion ltd. 2010. Print. Raffaele, Herbert A., author. Wildlife of the Caribbean. Princeton University Press. 2014. Print. The Nature of Cuba. Smithsonian. 2003. Web. 30 September 2015. Vireo Gundlachii (Cuban Vireo). Neotropical Birds. 2010. Web. 30 September 2015. Craves Julie A., and Kimberly R. Hall. “Notable bird sightings from Cuba, winters 2002 and 2003.” Journal of Caribbean Ornithology 16 (2003): 31-34. Jean W. Graber. “Distribution, Habitat Requirements, and Life History of the Black-Capped Vireo (Vireo atricapilla).” Ecological Monographs 4 (1961): 313-336. Kirkconnell, Anuro, and Orlando H. Garrido. “The Thick-billed Vireo, Vireo crassirostris (Aves: Vireonidae), a new addition to the Cuban avifauna.”Ornitología Neotropical 2 (1991): 99-100. Penelope Williamson. “Feeding Ecology of the Red-eyed Vireo (Vireo olivaceus) and Associated Foliage-Gleaning Birds.” Ecological Monographs (1971): 129-152. Stephen W. Eaton. “Wood Warblers Wintering in Cuba.” The Wilson Bulletin (1953): 169-174.